So anyway, why bring Barth and Schmitt into dialogue? First of all, Eichhorn argues that both thinkers made their fundamental intellectual decisions in the face of the catastrophe of 1914-18. Barth and Schmitt both believed that the catastrophe in Europe was a political consequence of the Enlightenment, with its liberalism, its rationalism, and its doctrine of progress. 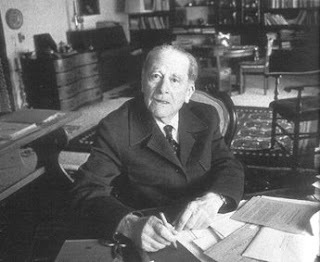 In Schmitt’s view, the category of “the political” is constituted by the irreducible relation of friend and enemy (Freund und Feind). And according to Eichhorn, the closest structural relation between Barth and Schmitt lies here: the same accusation which Schmitt brings against political liberalism – that it is no longer capable of perceiving the distinction between friend and enemy – is directed by Barth against theological liberalism. While political liberalism pursues the dream of rational consensus and so pretends that there is no longer an enemy, theological liberalism similarly eliminates the category of heresy, so that the theological distinction between friend and enemy disappears. And this disappearance of heresy, Eichhorn argues, has grave political consequences. In Barth’s view, liberal theology had forfeited the capacity to resist the National Socialist regime. 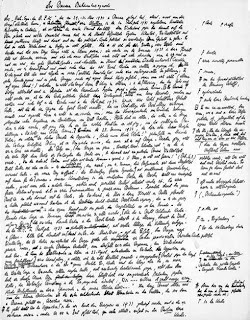 Indeed, Barth’s own struggle against liberal theology was precisely an attempt to reintroduce the distinction between truth and heresy, so that a theological intervention in the state would again be possible (just think of the Barmen Declaration, with its profoundly political deployment of the concept of heresy). In short, Eichhorn argues that the (Schmittian) friend/enemy political distinction requires a (Barthian) theological distinction between truth and heresy. Eichhorn thus points to a fundamental irony in Schmitt’s thought: in spite of his concept of the enemy, Schmitt refuses to recognise the validity of theological judgment as the means of distinguishing friend from enemy. His concept of the enemy thus lacks its internal theological criterion, without which it finally becomes arbitrary. Indeed, Schmitt was even tempted to regard the theologian as the fundamental enemy who endangers the state – even though the theologian, with his concept of heresy, is the only one who might have authentically distinguished friend from enemy. And while the politically anti-liberal Schmitt was undecided about theological questions, the theologically anti-liberal Barth was able to be passionately committed not only to theology, but also to democratic politics. This difference, Eichhorn suggests, is not coincidental, since each thinker’s stance in relation to theology was constitutive of his understanding of the state. Indeed, when Schmitt “threw himself into the arms of Behemoth” in 1933, he showed that he had become incapable – theologically incapable – of distinguishing friend from enemy. Drawing on Schmitt’s own remark that the enemy is always “my brother,” Eichhorn thus concludes this fascinating and provocative study with the poignant observation: “The enemy is always a part of me, not a stranger and not remote from me. In this sense, Karl Barth was – like no other – the enemy and the brother of Carl Schmitt” (p. 276).